The FOX Senator’s 912 K St. entrance as it appeared in November of 1953. This was Sacramento’s finest movie palace, built by architects Stark and Flanders and opened September 29, 1924. They had also built the 14 story Elks Building in 1926 and later, the Alhambra Theatre. The image is deceptive, as the theatre was not really on K St. at all, but built between L St. and the alley behind the building in this photo. FOX theatres owned the L St. building with the 2,106 seat auditorium, but leased the center section of the first floor of the building in this photo to have a K St. entrance and marquee for the theatre, as K St. was the most trafficked theatre street of the 1920-50’s. Oddly, the reason that the building in the photo is still standing and the theatre is not is because of this lease arrangement. Patrons got a ticket at the box office in the picture, entered the doors behind, and traveled up a long mirrored Louis XIV style lobby corridor that went up and over the alley to the auditorium on L St. Opened as the FOX Senator, locals always called it the FOX theatre, as it was the FOX theatre chain’s Sacramento flagship. This was the first Sacramento theatre installed with the wide screen process CinemaScope and Stereophonic sound on October 28, 1953 when it played the first film in that format, The Robe. 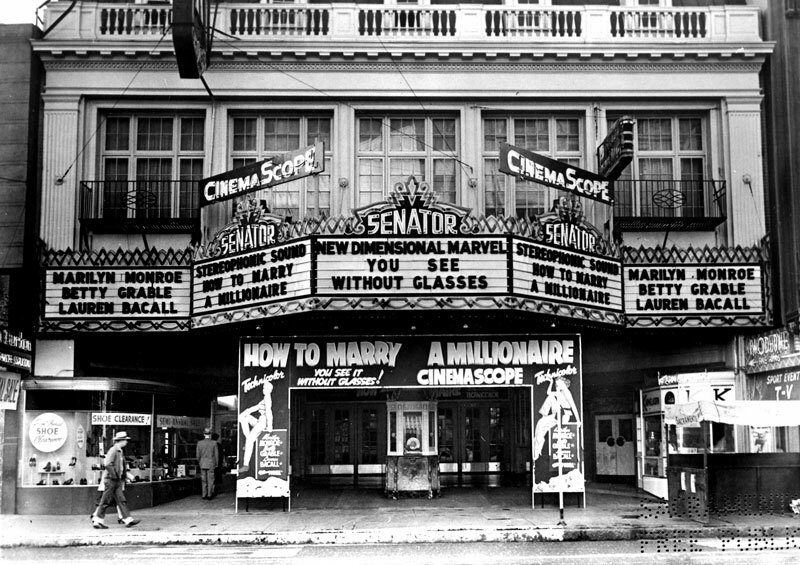 The Senator’s giant stage, Robert-Morton theatre organ and big seating capacity, augmented by the Trianon Ballroom above the K St. entrance and ”The Moderne” nightclub to the right of the box-office, would have been the multipurpose entertainment center to save for Sacramento’s future. The last film was shown in 1972 and the L street auditorium was demolished the following year. The K St. marquee remained until the mid ‘80s, and when it was dismantled, I took all of the milk glass from the reader board over to the Crest Theatre for use there. The K St. building is now offices on both floors.